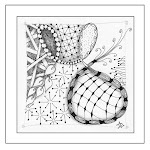 Zentangle - Time To Tangle: Zentangle and Mrs. Garfield? Wow! That wallpaper is wonderful. Thanks for sharing! Fun find! I'm hoping that I my path will take me there some day. Very interesting. I love the patterns in that wallpaper. That is way too cool. Go figure. Thanks for sharing this. Fascinating wallpaper! and, to my mind, highly unusual for that time period. So glad you enjoyed the post. I agree that this seems unusual for the period. We tour lots of historical sites and have never seen anything like it. I will try to add another photo of another unusual wallpaper in the house in a few days.